This is Blackbird, it's a wind-powered car designed by an aerodynamicist to end a longstanding internet debate, namely, 'Can you go downwind faster than the wind?' Using high-tech designs and precise instrumentation, Blackbird proves you can. Directly Downwind Faster Than The Wind (DDWFTTW) is a favorite topic of debate across the nerdverse for the combination non-existent answer and apparently conflicting nature of the question. "Wind only goes X-speed, how can you go faster? If you go faster don't you violate the law of conservation of energy?" That's usually the way the discussion goes. When aerodynamicist Rick Cavallaro at Thin Air Designs heard about the debate causing nerd-rage all over the internet he decided to see if he could prove the naysayers wrong. Along with a group from San Jose State University Aerodynamics department, Rick designed a vehicle to put the debate to rest, it's called Blackbird and although it's weird looking, it works. What Rick knew was there was plenty of power in the wind, but while harnessing it with a sail seems efficient it's actually not. A good deal of the wind spills over the sides, a sail has no way to store energy other than the inertia built up in the craft it's attached to and it can be complicated to steer. Instead, Blackbird has a propeller designed and optimized to capture and convert wind to mechanical power. The prop allows for the same conversion of wind force to craft inertia but adds a degree of energy storage in the spinning propeller, that's not to say there's any kind of energy storage other than that. The blade is mechanically linked to the axle through fixed gearing and there's no on-board energy stored when the vehicle is stationary. It's mounted to a load-cell-instrumented hub at the top of a steel A-frame and drives a geared axle which drives the vehicle. The frame is a steel skeleton reinforced with carbon-fiber strands, covered in shaped foam which is then covered in fiberglass. Wheels are actually heavy duty Velocity Dyad 27" tandem bike rims only mounted to custom-machined racing go-kart wheels to act as hubs and provide better side loading and lower rolling resistance. Differential action around a corner is provided by a re-purposed 3/4" ratchet drives mounted inside the hubs (very clever and cheap). 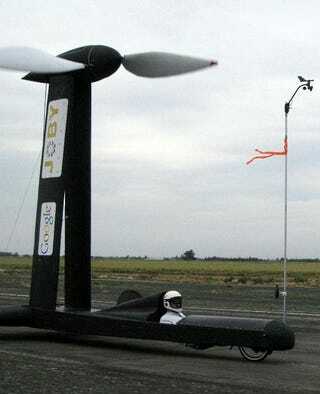 After some tweaks to the mechanics following a prop hub breakage the team wrapped things up with a full aerodynamics package and painted it all black then folded the thing up like wind-powered origami and headed for the New Jerusalem runway in Tracy, California for testing. With the machine instrumented with GPS and wind speed and direction collecting equipment the first runs returned speeds of up to 38.47 miles per hour, which is 2.85 times the average wind speed of 13.5 miles per hour. Pretty neat. Rick and his team are still refining the machine and hope to push for higher speeds, but they've proved beyond the shadow of a doubt you can drive down wind faster than the wind. Take another look at the picture at the lead of the story, the streamer on the instrument mast is pointing backwards.